Thanks for tuning in for Part II of ‘Get better Google search results with SEO’. If you missed Part I you can find it here. What comes up when you Google your name and your book? Anything? Try mine, if you’d like – Google: Jen Smith SICK. I come up in eight of the top ten listings most of the time and my book and blog have only been out since mid February. How does this happen? I’m going to share with you some of the top trade secrets that have been shared with me by Scott Wasserman of WSI Internet Marketing. I use WordPress.com for my blog so my tips are focused on WordPress. First off have the Platinum SEO Pack plugin installed in your WordPress blog. This is free! In case you forgot, SEO stands for Search Engine Optimization. Download the plugin from the link, go to your WordPress account, go to plugins, add new, upload zip file as is. There are several SEO plugins out there to choose from. This is just one option. The most important thing to look for is that the SEO plugin has a place to add the title and a description. When the SEO plugin is installed it is simple to use. You will be prompted to fill in the title and description in specific boxes before publishing a new blog post. Make sure your title is brief and accurately descriptive. If your blog post is pulled up in a Google search this exact title and description will be viewed. I’ve been reading more and more about the importance of a good title. Not only does it need to be catchy so somebody wants to click on it, you also want to try to use some of your key words in the title, these are also your tag words as discussed in Part I. I am a control freak and love this feature! Before my SEO enlightenment I had no idea we could control the exact wording of a Google search listing. And most importantly don’t forget to add your tags for every new blog post. The Platinum SEO plugin will also have a special box for you to include your tags. WordPress also has a box to add tags. Make sure you always fill in both boxes. Pretty groovy don’t you think? This can be done in your WordPress blog by going to settings, permalinks, and changing from default to ‘post name’ under common settings. Don’t forget to save. Google will sometimes search your URL to pull up your page. Other times Google will read the title or choose to use a section of your page’s text. If you want to get into the nitty gritty of SEO here’s a guide for you to read. Share buttons are incredibly important to have on your blog. We talked about sharing all of your post to Google plus in part one. If you don’t have a Google plus share button, check out Shareaholics. It’s free! AddThis is another option for share buttons. These options can give you an additional row of share buttons around your blog post. Put share buttons at the top and at the bottom of your post. The bottom is important for those folks who actually read entire posts before they decide to share them. WordPress does have share button options that can be utilized but the more share buttons the better chances your article will be shared. In my opinion the worst thing you can do in today’s social networking world is have a great blog post and no share buttons for me to tweet it and share it on Facebook and Google plus. Nothing annoys me more and screams social network newbie! If you can’t figure this stuff out on your own, you can always pay someone else to do it, like my friend Scott. Shop around as prices vary greatly for Web support. My friend Scott isn’t cheap but you get what you pay for. The last thing I learned that I have to share with you is this: Google loves content. The more (preferably good) content on your blog the better chances of it being pulled up in a Google search. So go blog your brains out! Are you more confused than ever or was this information helpful? Do you have any of your own tips to add? 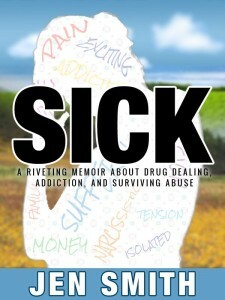 Jen Smith is author of the memoir SICK which is available at Amazon, Barnes and Noble, and Smashwords. Learn more about Jen and her writing at her blog. You can also find her on Facebook and follow her on Twitter. A version of this post originally appeared on Jen Smith’s blog. Good stuff, Jen. Thanks for sharing it. Wow. Your 2-part article saved me several weeks of reinventing the wheel. Thank you so much! If you even need anyone to help you hide a body or something, give me a call. I owe you a big one. Jen: Great points, and right on the money. My YA historical novel, "Buffalo Soldier: Trial by Fire," is in a similar place. It comes up as 7 of 10 on page one of a Google search when I put in the title and my name, thanks to effective use of SEO.